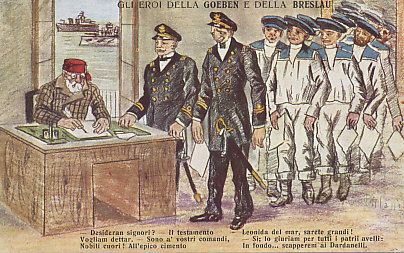 Captains and sailors of the German battleships Goeben and Breslau signing up for the Turkish Navy. After shelling Allied ports and sinking Allied ships in the Mediterranean, the two ships had entered Turkish waters at the Dardanelles on August 8, 1914. Claiming the ships and their crews as Turkish allowed Turkey to maintain a veil of neutrality for a time. This was dropped on October 29 when the ships sank a Russian gunboat in the Crimean Black Sea port of Odessa. The postcard's caption compares the captain to Leonidas who died leading the Greeks at the Battle of Thermopylae in 480 during Xerxes's invasion in the Second Persian War. - Il testamento Vogliam dettar. - Sono a' vosti comandi, Nobili cuori! All'epico cimento Leonida del mar, sarete grandi! - Si; lo giuriam per tutti i patrii avelli: In fondo . . . scapperem ai Dardanelli. - What do you wish, gentlemen? - We want to dictate our wills. - I am at your service, Noble hearts! In this epic ordeal, Leonidas of the sea, you will be great! - Yes, we swear it on the graves of our countrymen: In the end … we will escape to the Dardanelles. In the Russo-Turkish War of 1877-78 and the 1878 Treaty of San Stefano, Russia had acquired territory between the Black Sea and Persia, shifting its border with the Ottoman Empire to the southwest from the Caucasus Mountains, incorporating the fortress of Kars and the city of Ardahan into the Empire. The Turkish territory was populated by Turks, Armenians, and Kurds, many Eastern Rite Christians. The border between the Russian and Ottoman Empires ran approximately 200 miles from the Black Sea to Persia. Much of the land is mountainous. The Russian Army of the Caucasus operated independently, and had lost over half its strength in transfers to fight Germany and Austria-Hungary. When Turkey entered the war, Russian forces in the area totaled about 80,000 men, and were stationed in the Russian fortress in Kars, along the border, and further back, in the regional capital of Tiflis. Russia's rail system in the region was good; Turkey's was not. In Constantinople, Turkish War Minister Ismail Enver Pasha, one of the Young Turks who had seized power from the Sultan in 1908, wanted to retake this land lost to Russia in 1878. On November 2, 1914, he ordered the commander of the Turkish Third Army to invade Russia. The same day the the Turkish general received his orders, The Russians invaded Turkey with one army corps of nearly 35,000 men, aiming for the Turkish fortress city of Erzurum. Having some success in a battle at Köprüköy on November 6, the Russian commander ignored orders to stop, and tried to continue advancing, with little success, having encountered part of the Turkish Third Army. On November 12, the Turks drove him back to his starting line. A few days later, the Russians again advanced, but to little effect. Fighting stopped as winter set in. In the campaign, the Russians lost almost 7,000 men, and the Turks somewhat more.